I was driving earlier this week and noticed a couple of Yuengling billboard ads. Billboards are hard to do as the good ones contain 7 words or less. It seems the Yuengling tagline is “spread your wings,” which until further notice with be their brand strategy claim. (A brand strategy is one claim, three proof planks.) 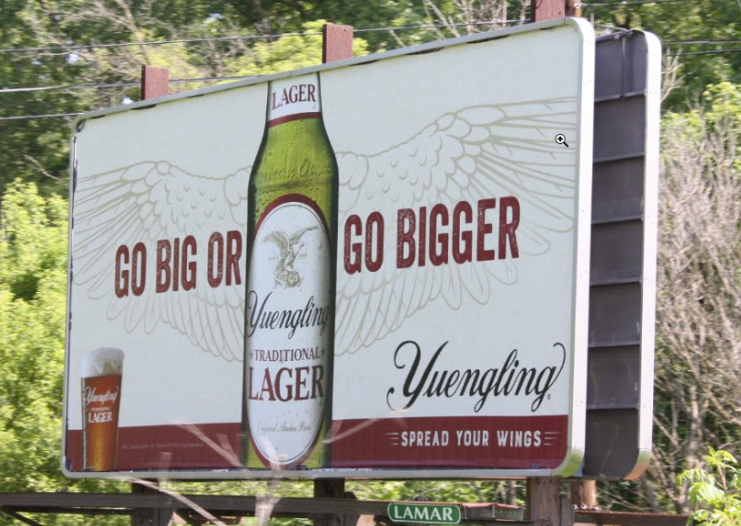 Yuengling is America’s oldest brewery, but that proof shouldn’t get in the way of a fallow claim like spread your wings. Everyone wants to spread their wings, no? Basically, Yuengling has no brand strategy…they have a logo. That’s how you get headlines line “go big or go bigger.” This is lazy and poor brand craft. Brand strategy is the thoughtful result of consumer care-abouts and brand good-ats. Where ever the twain shall not meet, we get wings. Previous article“It’s all about focus.” Really? Next articleTwitch And You Will Find.